Talented Tim Pruvost captures with incredible angles of an epic swell. Watch the breath taking mind boggling moments. Then ask yourself, how do they survive? We thought we had seen everything the swell that hit Tahiti last week but this last edict is there to prove otherwise. There are some days the wave of Teahupoo turned into a monster, and the largest shippers in the world it is given an appointment. Local as Matehau Tetopata , Matahi Drollet , Angelo Fareire , Raimana VB and Mihimana Braye ensured the show. None of them was hurt, not even Niccolo Porcella which wipe-out images have yet toured the world as it was violent. 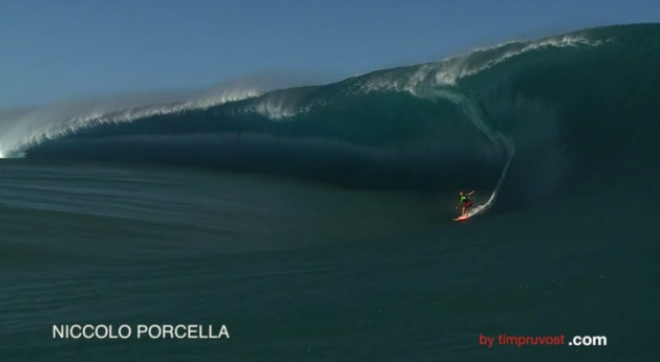 Teahupoo Orange Code July 2015 from Timothée PRUVOST on Vimeo. Aloha Rod, we really don’t. But if you’re offering….Thnks! The writing definitely needs some editing. Some of it just makes no sense. No hard feelings.